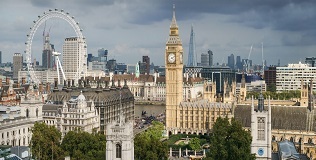 London is the capital city of England and the United Kingdom, and the largest city, urban zone and metropolitan area in United Kingdom, and the European Union by the most measures. Located on the River Thames, London has been a major settlement for two millennia, its history going back to its founding by the Romans, who named it Londinium. It is a leading global city, with strengths in the arts, commerce, education, entertainment, fashion, finance, healthcare, media, profession al services, research and development, tourism and transport all contributing to its prominence. 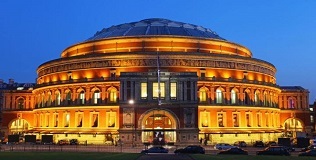 London has been described as a world cultural capital. London has been described as a world cultural capital. It is the world's most-visited city as measured by international arrivals and has the world's largest city airport system measured by passenger traffic. London's 43 universities form the largest concentration of higher education in Europe. In 2012, London became the first city to host the modern Summer Olympic Games three times. A multicultural city, London has a diverse range of peoples and cultures, and more than 300 languages are spoken within its boundaries. London has four World Heritage Sites: the Tower of London, Kew Botanic Garden, the Palace of Westminster, and St Margaret's Church, National Maritime Museum, and the historic settlement of Greenwich Observatory. 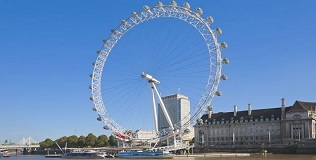 Other famous landmarks are Buckingham Palace, the London Eye, Piccadilly Circus, St Paul's Cathedral, Tower Bridge, Trafalgar Square, and The Shard. London is home to numerous museums, galleries, libraries, sporting events and other cultural institutions, they are the British Museum, National Gallery, British Library and 40 West End theatres. The Railway of London Underground is the oldest underground railway network in the world. 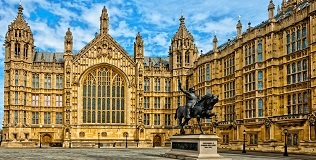 London is the seat of the Government of the United Kingdom, which is located around the Palace of Westminster. London's status as the capital of England, and later the United Kingdom, has never been granted or confirmed officially by statute or in written form. 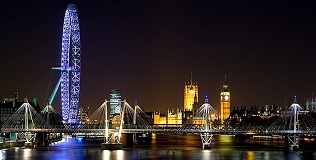 London is one of the pre-eminent financial centers of the world and vies with New York City as the most important location for international finance. London's most popular sport is football and it has fourteen League football clubs, including six in the Premier League: Arsenal, Chelsea, Fulham, Queens Park Rangers, Tottenham Hotspur, and West Ham United. London also has five rugby union teams in the Aviva Premiership (London Irish, Saracens, Wasps, London Welsh and Harlequins), although only Harlequins and Saracens play in London. Cricket in London is served by two Test cricket grounds Lord's (home of Middlesex C.C.C.) in St John's Wood and the Oval (home of Surrey C.C.C.) in Kennington. Lord's has hosted four finals of the Cricket World Cup. 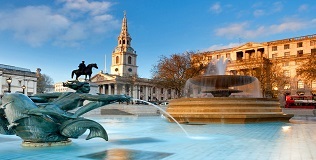 London has a temperate oceanic climate, similar to much of southern Britain. London has four seasons: Winters are generally chilly to cold with frost usually occurring in the suburbs on average twice a week from November to March. Snow usually occurs about four or five times a year mostly from December to February. Snowfall during March and April is rare but does occur every two or three years. Summers are generally warm and sometimes hot, the heat being boosted by the urban heat island effect making the centre of London at times 5 °C (9 °F) warmer than the suburbs and outskirts. Spring and Autumn are mixed seasons and can be pleasant.